The Friday The 13th franchise is littered with characters that are sometimes more villainous than Pamela or her son Jason. Our new series of articles will focus on the villains of Friday The 13th not named Voorhees and their affect on those around them, along with the character's place among the most vile in the franchise. A villain is an "evil" character in a story, whether a historical narrative or, especially, a work of fiction. The villain usually is the antagonist, the character who tends to have a negative effect on other characters. The Random House Dictionary defines a villain as "a cruelly malicious person who is involved in or devoted to wickedness or crime; scoundrel; or a character in a play, novel, or the like, who constitutes an important evil agency in the plot". Our next character certainly fits the bill in that respect. 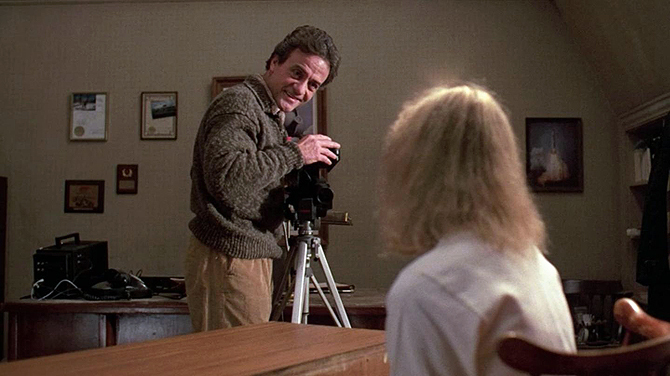 Dr. Crews is the self serving therapist that lures Tina Shepard and her mother to Crystal Lake to exploit Tina's telekinetic gift in Friday The 13th Part 7: The New Blood. Crews brings mother and daughter to their old family home on the lake under the guise of better therapy, but what he really wants is to heighten the trauma of the teen girl and bring out her abilities to further his career. As bodies mount from Jason Voorhees, the good doctor continues to conceal the truth in hopes of still being able to exploit Tina for his career. The lengths that which Crews would go to exploit Tina included hiding the tent spike that Tina found stuck in her back porch, placed there by Jason, as well as hiding the fact that he found the dead body of birthday boy Michael in the woods. In perhaps the most despicable act of them all, after going out to search for a runaway Tina, he uses her mother, Mrs. Shepard, as a human shield as Jason impales her on a brush hook. In the end, Dr. Crews got his comeuppance, but his deplorable acts of deceit, exploitation and being an accessory to murder rank him as possibly the most villainous character in the entire Friday The 13th franchise.